Choosing Machame route for your Kilimanjaro hike means smooth acclimatization and amazing views. This option is the second in popularity among the climbers, and the number of other climbers may be high. Arrival day Arriving to Kilimanjaro International airport (Tanzania). Transfer to hotel 3* in Moshi. Info briefing at hotel. Overnight at hotel. From Machame Gates to Machame Camp (2834 m). Elevations: Machame Gates (1634 m) – Machame Camp (2834 m) Trekking route distance: 5 km Duration of trekking: 3-4 hours Breakfast at hotel. Transfer to the Northern Entrance to the Kilimanjaro National Park – the Machame Gate. After the park permits are arranged, and the crew is registered with the emergency service, the group treks through the tropical forest to the first check point – Machame Camp (2980 m). Trekking to the Machame Camp takes approximately 3 hours, and it commences your gradual acclimatization process. The camp will be organized by our guides before your arrival, and the cook will take care of the warm drinks. Overnight at tents. From Machame (2834 m) to Shira Camp (3 8 40 m). Elevations: Machame Camp (2834 m) – Shira Camp (3 840 m) Trekking route distance: 10 km Duration of trekking: 5-6 hours You rise early at Machame camp, and after breakfast, climb for an hour to the top of the forest, then for 2 hours through a gentle moorland. After a short lunch and rest, you continue up a rocky ridge onto the Shira Plateau where you will be able to see Kilimanjaro’s great Western Breach with its stunning glaciers. Sometimes, the walls of the Western Breach are draped with extensive ice curtains. You are now west of Kibo on the opposite side of the mountain from the Marangu Route. After a short hike west, you reach the Shira campsite. The porters will boil drinking and washing water before serving dinner. The night at this exposed camp will be colder, with temperatures dropping below freezing. Overnight at tents. From Shira Camp (3 8 40 m) to Barranco Camp (3 950 m) Elevations: Shira Camp (3840 m) – Lava Tower (4630 m) – Barranco Camp (3950 m) Trekking route distance: 15 km Duration of trekking: 6-8 hours Semi-Desert After breakfast, you will hike east up asteepening path above the highest vegetation toward Kilimanjaro’s looming mass.After several hours, you walk through a rocky landscape to reach the prominentlandmark called LavaTower at 4,630 m/15,190ft. This chunky remnant of Kilimanjaro’s earlier volcanic activity is severalhundred feet high, and the trail passes right below it. For extra credit, thesure-footed can scramble to the top of the tower. After a lunch stop near Lava Tower,descend for 2 hours below the lower cliffs of the Western Breach and BreachWall to Barranco Camp at 3,950 m/12,960 ft. There are numerous photoopportunities on this hike, especially if the walls are festooned with ice.Barranco Camp is in a valley below the Breach and Great Barranco Walls, whichshould provide you with a memorable sunset while you wait for your dinner. Onthis day, be careful to notice any signs of altitude sickness. Overnight at tents. Summiting on Uhuru Peak and Descent to Millennium Camp Summiting starts around midnight from 4,635 m, ending on Uhuru Peak at 5,895 m. While the trek itself is fairly simple, rarified mountain air does does pose a challenge. Therefore, a guide who will monitor their condition throughout the climb shall accompany every two climbers ensuring safety above all. Upon summiting, you shall have an opportunity to walk on the nearby glacier. 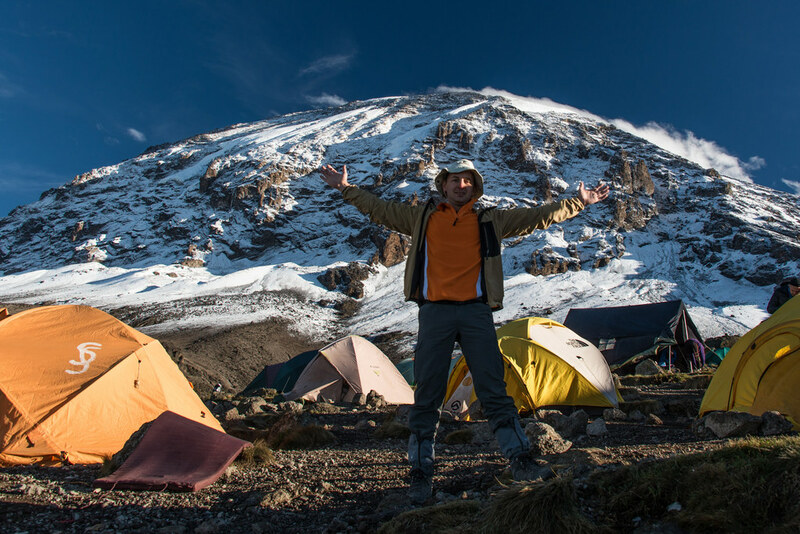 The descent to 3,820 m at Millennium Camp starts after a two-hour rest back at Barafu Camp. NB: Descent is deceptively easy with treacherous footing and results in 90% of accidents. Mind your feet if you want to avoid falling and damaged toenails! Altitude: Barafu Camp (4,640 m) — Uhuru Peak (5,895 m) — Millennium Camp (3,820 m) Distance: 15.5 km Time: 7–12 hrs. Descent From Millennium Camp to Mweka Gate This last camp’s position being far lower at the forest line will afford you a good night’s sleep further enhanced by thoughts of having reached the top. Breakfast will be followed by the return to 1,650 m at the final point in this adventure- Mweka Gate. After a short celebration with the whole of the climb crew and arrival at our offices, you will receive your climb certificates, followed by the drive to your lodge. Altitude: Millennium Camp (3,820 m) — Mweka Gate (1,650 m) Distance: 12 km Time: 4–5 hrs. Transfer to airport. Departure from Tanzania. You entrust your life, health, your time and money to the guides. And the guides take this responsibility for you and for the success of the whole trip. They are doing this 24 hours.